Our import section allows you to import new CSV files into the product and view import history. If you are integrated with a CRM system, you will need to contact your Account Manager in order to gain permission to import CSV's. This is needed because it can have possible ramifications. 1. Select 'Import new CSV' to open a new window. 2. Enter the name of your CSV File in the box above. 3. Select the 'Add' button. 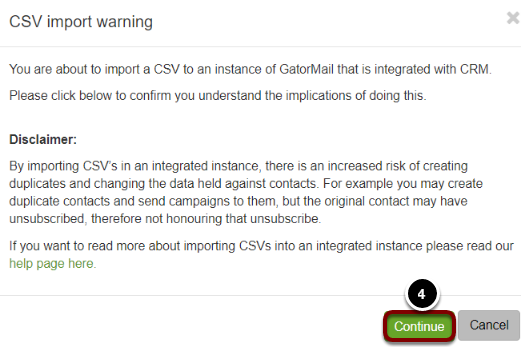 If the above warning appears this indicates that you are using an integrated instance of GatorMail with a CRM system, and you may need to speak to your Account Manager to enable the Import CSV ability for the first time. However, this warning will appear each time you import a CSV. 4. If you are happy with this then click 'Continue'. 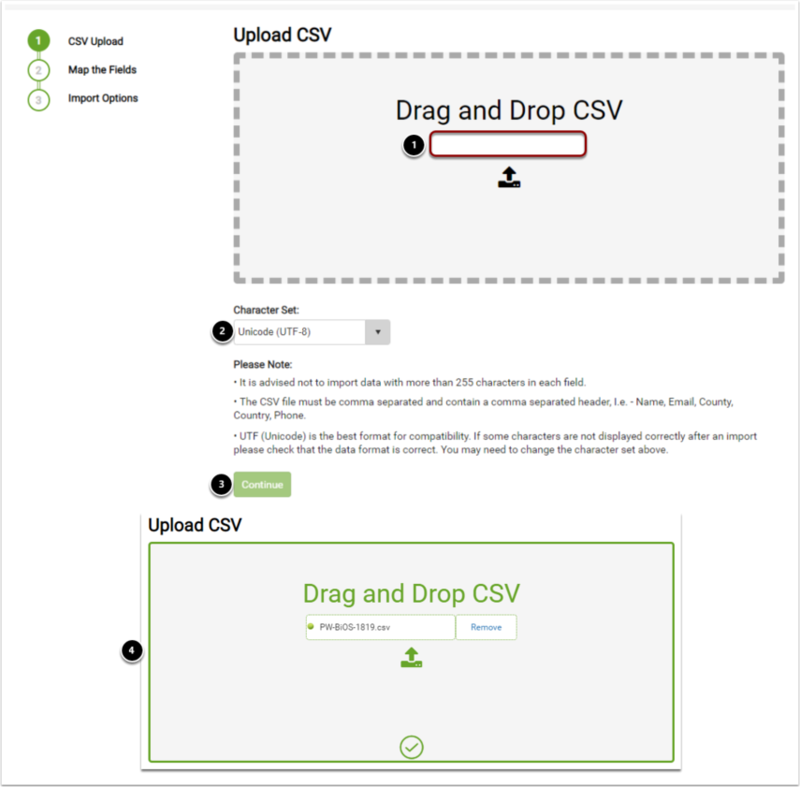 Drag your CSV file onto the section of the screen as illustrated above, or select the box to manually upload your CSV. Select your Character Set. We recommend UTF-8 as it is compatible with most formats and browsers. Select 'Continue' once this section is complete. When the file has been uploaded it will appear as above. Here you can apply an existing mappings template. Simply select the dropdown to pick a template to use. This key will tell you if your mappings are matching correctly in name. This is essential as fields which do not match those already used will not appear as intended. This is your list of field mappings. It will look at the fields of your CSV and try to match them to your file headers. Give a name to your template if you wish it to be a saved template available for use in the future, then click 'Continue' when ready. Start typing in the name of a group and it will bring up the full group name. Then you can select it to add the CSV contents to. Or you can create a new group for this information to sit in. Here you can select whether the email format is changed for the members of the group. This can be changed to HTML or Text format. Or you can choose not to force select an option. 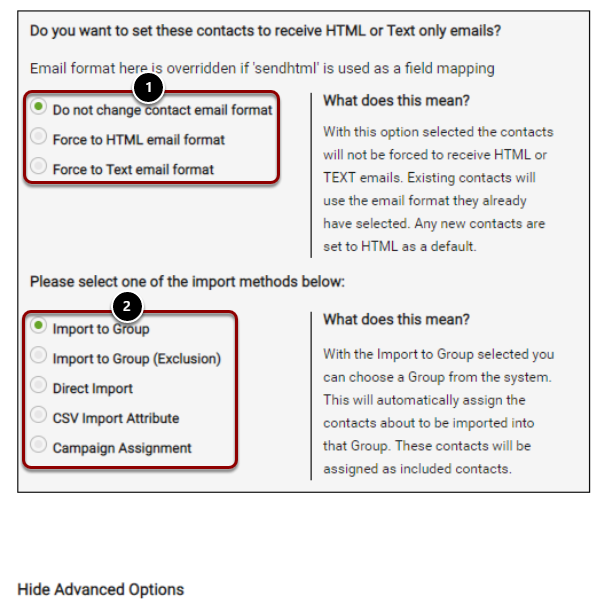 Here you can choose to import to a group, import to an exclusion, directly import, import via a specific CSV attribute, or import via campaign assignment. - Import to Group: This allows you to import the data within your CSV to a selected group. - Import to Group (Exclusion): This will add contacts to the excluded contacts section within the group builder. Please Note: this is not "excluded Groups". - Direct Import: Using the direct import option will add all imported contacts directly to the CommuniGator contact database. This can be used for populating existing groups where by the contact meets the criteria of the filter. This can also be used for updating contact data. - CSV Import Attribute: This enables you to use the import file name as the searchable label when applying an audience directly against a campaign, using the audience selection criteria option. This can be used when you do not require the creation of audience groups within GatorMail. - Campaign Assignment: This is used when you have created the required filters for the audience group outside of CommuniGator. For example, where you have extracted data from CRM and have already applied the relevant filters. 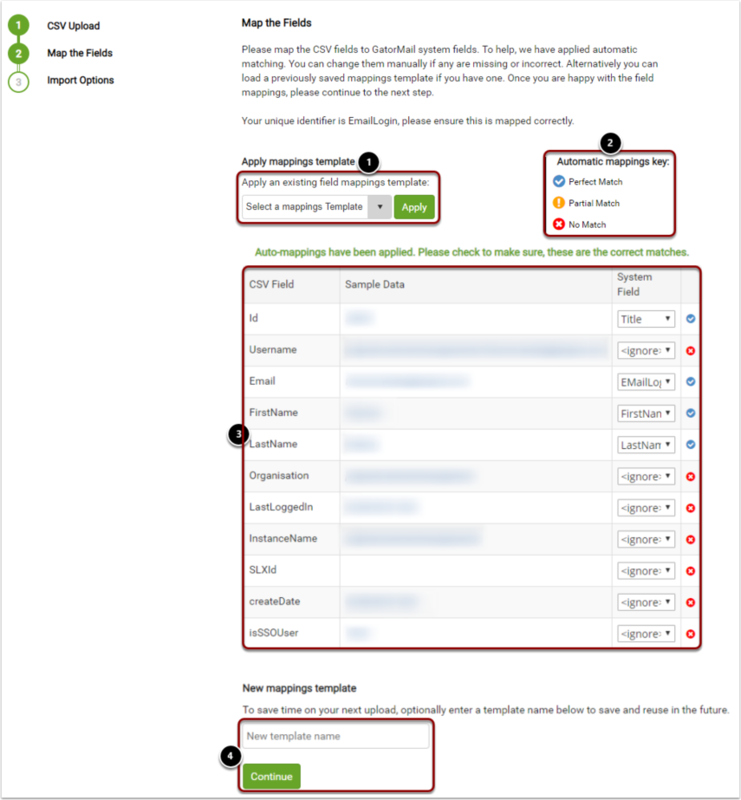 We would only recommend using this functionality if you do not envisage using this audience criteria against other campaigns, otherwise we recommend importing to a group. If this field is left blank the contacts will only be imported into the database and not assigned directly to a Campaign. Next: My CSV file isn't uploading!